I remember last time we went to the beach, Ramil warned us not to take pictures of children. The Japanese are overprotective of children and there seems to be a law against photographing random kids. It is quite understandable since their are pedophiles around but this also limits the subjects for photographers. Kids are great photographic subjects as they can easily show elements of joy, sorrow, innocence, etc not to mention that they are usually cute. Good thing my shots with kids before did not offend a parent. Generally it's quite a challenge to take pictures of random people, and that's one of the main reasons why I needed longer lens. 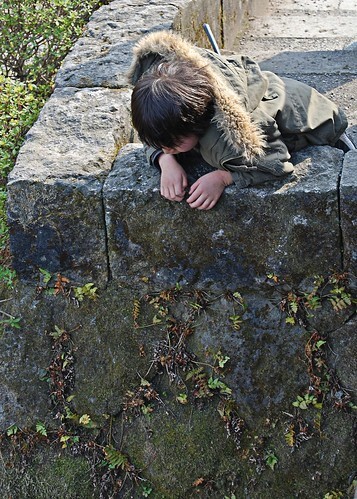 Photo shows a kid looking down below towards the small stream, watching the fishes swim by.